ATEN 4K DisplayPort/USB 3.0 KVM switches take a giant leap forward in KVM switch functionality by combining a KVM switch with a DisplayPort video interface, 2-port USB hub and 2.1 channel audio support for rich bass in surround sound. 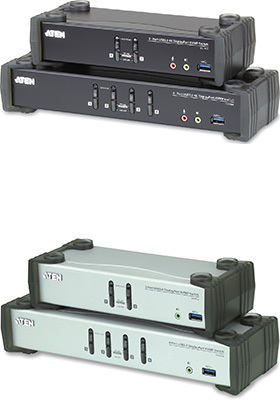 ATEN 4K DisplayPort/USB 3.0 KVM switches provide the latest innovations in desktop KVM switching technology for the increasing demand of higher video quality and transfer speeds on modern computers. ATEN 4K DisplayPort/USB 3.0 KVM switches offer unprecedented performance of delivering 4K resolution, the next generation USB 3.1 Gen 1 hub with SuperSpeed 5 Gbps data transfer rates and enhanced user-friendly operations. DisplayPort technology provides a 4K-Cinema DCI @ 60Hz or 4K Ultra-HD @ 30Hz resolution that displays the most vivid high-definition images available while pumping out premium sound for music, movies, and games. 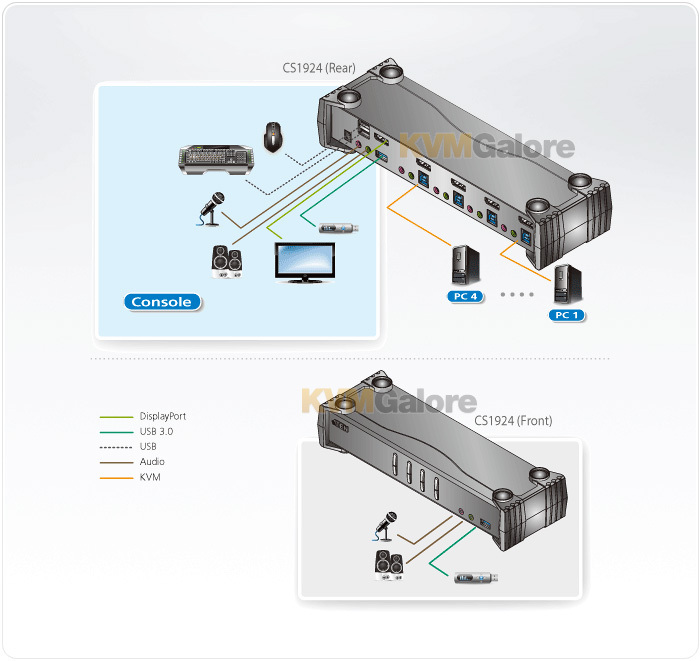 As a KVM switch, ATEN 4K DisplayPort/USB 3.0 KVM switches allow users to access two or four DisplayPort computers from a single USB keyboard, USB mouse and monitor console. Doing so with ease, ATEN 4K DisplayPort/USB 3.0 KVM switches provide three convenient switching methods - using front panel pushbuttons, mouse, or hotkeys for flexible access to any computer connected to the installation. In addition to the front panel pushbuttons and hotkeys, ATEN 4K DisplayPort/USB 3.0 KVM switches offer the latest mouse port-switching functionality which allows a double-click of the mouse's scroll-wheel to change ports. With a built-in USB 3.1 Gen 1 hub, ATEN 4K DisplayPort/USB 3.0 KVM switches SuperSpeed 5 Gbps transfer rates to all connected peripherals. The unique independent switching feature allows the KVM control to focus on one computer while the USB peripheral focus is on another computer. This eliminates the need to purchase a separate USB hub or stand-alone peripheral sharer - such as a print server, modem splitter, etc. A Power On Detection feature also ensures that if one computer is powered off, ATEN 4K DisplayPort/USB 3.0 KVM switches will automatically switch ports to the next powered-on computer. Featuring an unbeatable combination of ultra high 4K resolutions, a next generation USB 3.1 Gen 1 hub and enhanced, audio sharing and user-friendly operations, ATEN 4K DisplayPort/USB 3.0 KVM switches provide the latest innovations in desktop KVM switching technology. With their rich feature set, ATEN 4K DisplayPort/USB 3.0 KVM switches are designed to surpass all requirements in graphic design, animation, and video-editing applications, such as CAD/CAM (computer aided design/manufacturing).